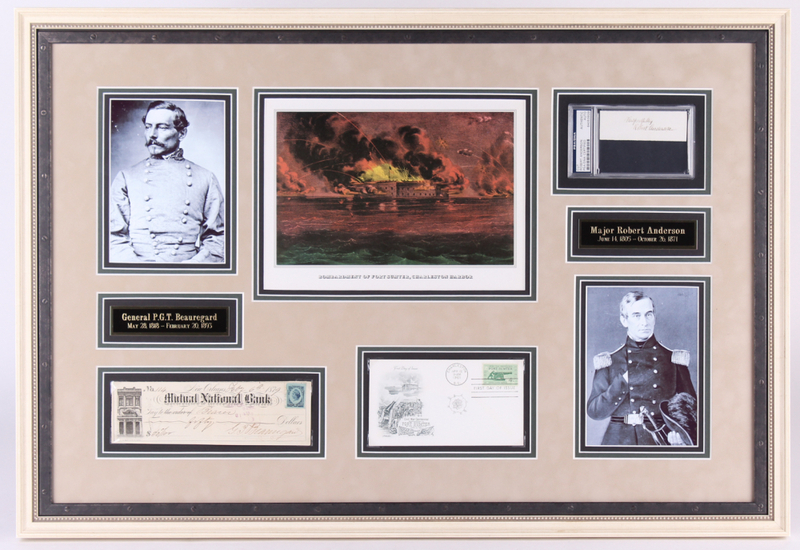 A must have historical piece for the avid US history and Civil War collector. This is a triple matted museum quality framed display measuring 22" by 32". It is covered in archival UV protected glass with glare reduction and suitable for generations of enjoyment. Seldom are the signatures of the opponents in the first battle of the Civil War available together. As is the case for most Confederate and Union Commanders, these two gentlemen crossed paths and were respected comrades in arms before the war broke out. For a time, Major later General Robert Anderson (June 14, 1805-October 26, 1871), was an instructor at West Point. One of his students was none other than Pierre Gustave Touissant Beauregard (May 28, 1818-February 20th, 1893), whose ancestral home was in New Orleans, Louisiana. Circumstances brought them face to face as opponents across the bay in Charleston, South Carolina. First General Beauregard offered cigars and whiskey to his opponent to acquire the surrender of Major Andersson's outnumbered and under supplied men. No one wanted to fire the first shot igniting what was to be the most costly war in American history. Anderson who was a Kentuckian by birth, was a staunch Union man, and refused this offer. When diplomacy didn't work, a furious fusillade of canon fire over a period of one day, forced Major Anderson to surrender. Ironically, no one was killed during the battle, but one Union artillery man died during a canon salute to the lowering of the US flag. Anderson became a hero in the North and was promoted to Brigadier General and was for a time given command of the Union forces in his home state. Though he retired from the army in 1863, he would return to Fort Sumter in 1865 and be part of raising once again the US flag he once had to lower. P.G.T. Beauregard went on to command the Confederate forces at Bull Run and routed the Union Army in the first major land battle just a few short miles from Washington, D.C. He went on to have an antagonistic relationship with Confederate President Jefferson Davis, thus reducing his role in further commands. The autographs featured are a JSA LOA of a Mutual National Check filled out and hand-signed in ink pen by P.G.T. 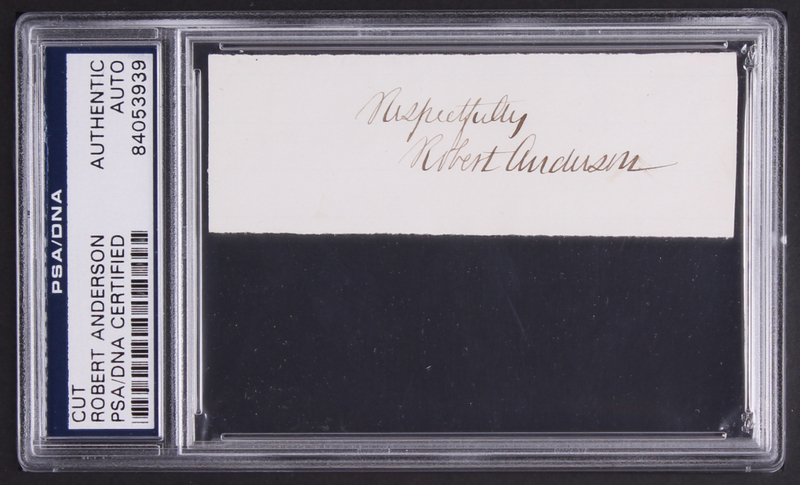 Beauregard, and a PSA/DNA encapsulated mint signature hand-signed in ink by Robert Anderson. 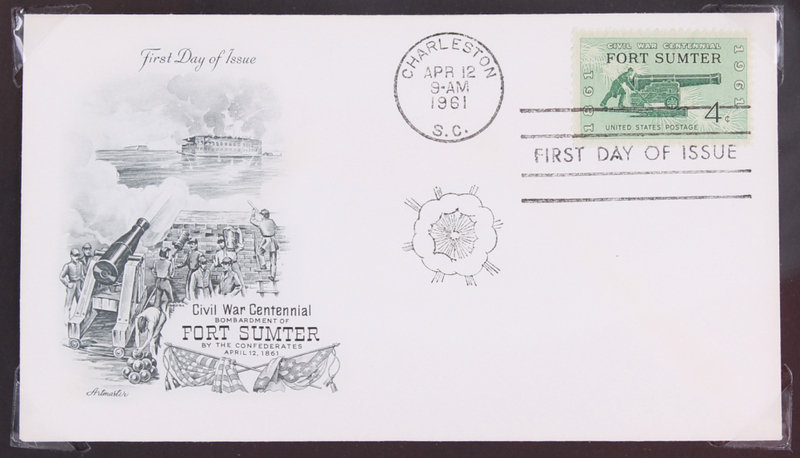 Featured as well in the display are an FDC of the centennial date of the battle, April 12, 1961. Post marked Charleston with a Fort Sumter stamp. A Currier and Ives replica colored lithograph of the Fort under siege. A B&W photo copy of period pictures of each commander, as well as identifying plaques with biographical dates of the lives of these men. All together, a superb one of a kind collector's item. 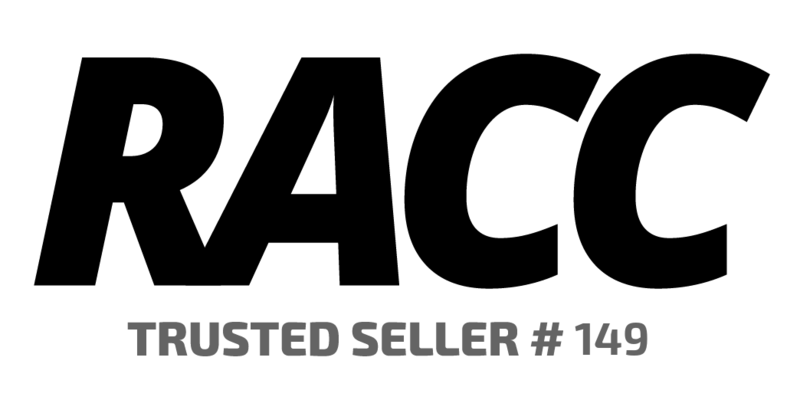 The lot / autograph(s) includes a James Spence Authentication (JSA) Auction House LOA as well as authenticated and encapsulated by PSA/DNA for authenticity purposes.